Barrhaven is one of Ottawa’s most family friendly communities, with an abundance of schools, including a new French public school being built right in Harmony. Turn free time into fun time. 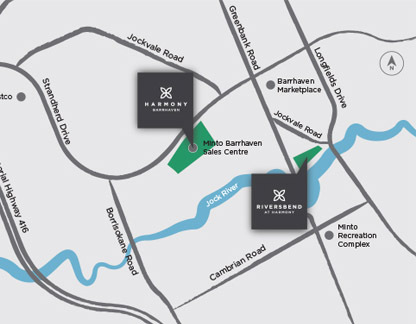 There’s access to superb facilities such as Minto Recreation Complex at the corner of Greenbank Road and Cambrian Road, and thriving shopping areas like Barrhaven Marketplace, Citigate, and a brand new Costco along Strandherd Drive right beside our new Harmony community. Barrhaven has all the amenities, conveniences, and transit options families need for their busy lifestyles. Designed to fit the needs of growing families, at Harmony, you'll find a wide array of parks and schools.